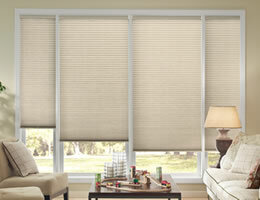 Good Housekeeping 3/8" Light Filter Double Cell Shades are designed with a smaller pleat size. The translucent fabric of these Good Housekeeping Window Cellular Shades allows filtered light to pass through the shades but still provide privacy. Our Good Housekeeping Light Filtering Cellular Shades are backed by the Good Housekeeping Seal for quality and workmanship. Choose from our exclusive Good Housekeeping colors and fabrics. We were very pleased with our shades. We were very pleased with our shades. They were easy to install, easy to operate, and allow a lot of light into the room. They seem to be well made. Blinds worked out perfectly and arrived quick. Blinds worked out perfectly and arrived quick. Would use this company again. Loved the service and especially the product. I love these blinds. They function and look fabulous! Very good. It may not really cut down noise it works just fine. Note: Two separate cords on opposite sides of the shade. Can only come with lift cord on the left and the top down cord on the right.